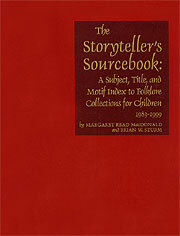 Our supplement to The Storyteller’s Sourcebook covers the years 1983-1999. This supplement indexes 210 folktale collections and 790 picture books! No wonder publishers keep telling me the market is already glutted with folktale picture books! Brian Sturm, of the University of North Carolina Library School, co-authored this edition and did all the database crunching! Thank him when you see him, so he will want to do it again.